But lag made using that boost effectively somewhat difficult, and turbocharging added needless complexity: additional displacement was a far more effective way to increase power, so the bike did not sell well, and examples are rare today. 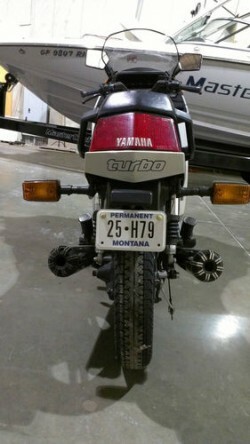 1982 Yamaha Seca Turbo. Really low miles, just 5,177 miles since new in 1982. Bike is all original with no modifications. Runs great – everything works. Has only normal aging for a 30+ year old bike – only issue I’m aware of is a very slow oil leak. No other issues. No reserve on this bike – please don’t bid unless you plan to purchase. 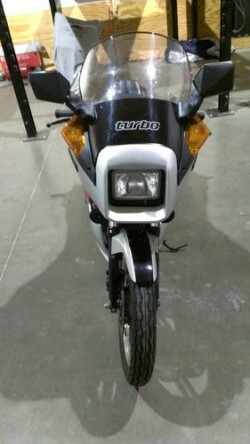 Bike is available locally for sale so Seller reserves the right to end auction early. $1000 deposit due withikn 48 hours of auction close. Balance due within 7 days of auction close. Buyer responsible for pick up and shipping although I can help coordinate and can suggest reputable shipping companies. Bid with confidence – it’s a great find! The Seca’s styling was considered very futuristic at the time, which meant it quickly looked very dated once the decade was over. Sort of like those chunky white Venetian-blinder sunglasses. But 80’s retro chic is coming back into fashion, and there seems to be a renewed interest in strikingly 80’s bikes and this quirky machine might push your nostalgia buttons. Or your techno-geek buttons: did you know that only the left muffler actually vents spent exhausts, and that the right is basically wastgate plumbing? This is a pretty clean example of a pretty rare bird and so far, the price is staying pretty low, with a starting bid of $3,500 and no takers as of this writing.